Normal everyday operations of your computer at home or work takes into your system a slow accumulation of data in the form of user preferences, security patches and protections, new applications and saved files, internet tracking and downloads – all of which, unless periodically consolidated and cleaned up, will end up oppressing your computer’s memory capacity and slowing its processing speed. Everything gets encumbered and takes longer to respond as your poor computer is trying its best to coordinate all those bits and bytes while still following your commands. Assuming an adequate operating system is buried somewhere under all that code, what needs to happen is a periodic adjustment where files can be discarded or compressed, programs can be updated to run more efficiently, and that accumulated weight of junk data can be scraped away like barnacles from the hull of a ship. Of course it’s always a good idea to sweep your system for malware (worms, bugs, viruses, and spyware) since that stuff can be terminal (pun noted). As a metaphor of life, this need to regularly clean out and update your computer system translates directly to the theory of constructivism. This theory holds that human beings are meaning-makers and, further, that meaning is in our minds, not in reality. As distinct from the physical environment where we live, our “world” consists in the overlay of values, associations, and references that our minds spin like a spider’s web across and beyond the given facts of existence. The picture we get from constructivism, then, is of multiple layers (or worlds) of meaning that human beings spin around themselves as persons, partners, families, teams, organizations, tribes, societies, and cultures. 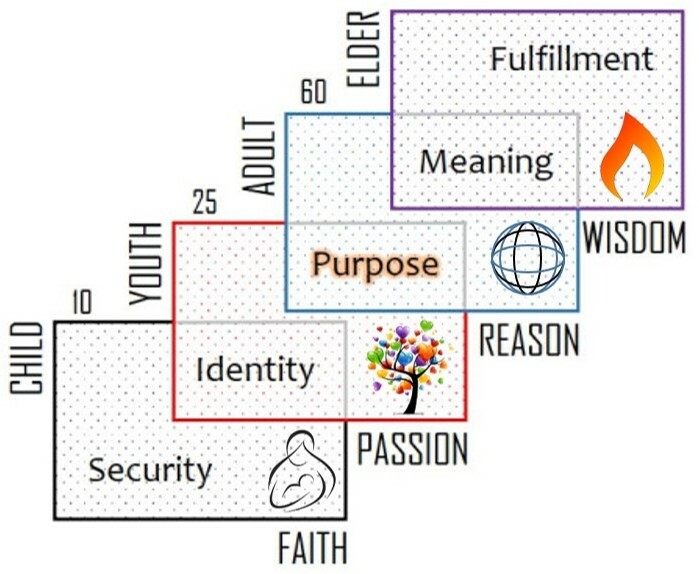 Let’s briefly explore this construction of meaning as it advances across an individual lifespan. This will prepare us to better understand the life transition that I name the “midlife reset,” when this accumulated meaning ruptures and our mental system needs attention. The above diagram illustrates a human lifespan, represented by a magenta-colored arrow arcing from left (past) to right (future). Consistent with a more general theory I’ve been developing, depending on where you are in the lifespan, the segment of time on your left also corresponds to deeper evolutionary layers of your “operating system,” while the segment on your right signals possibilities (and new layers) still to come online. In the womb and following our birth, individual consciousness is completely “embodied,” which is to say that it is fully immersed in the animal urgencies essential to staying alive. It will be many months before we are capable of thinking about our experience – using words, formulating thoughts, making abstractions, and drawing conclusions. In those earliest days and months we are responding to life as it happens, intent all the while on the degree in which the provision of reality matches the urgency of our need. The word “passion” derives from the same root as “passive” and is related to “patient,” referring to one who is in a basically receptive and reactive attitude with respect to what’s going on. Our passions (or to use the more modern term, our emotions) have evolved around the challenge of situational adaptation, giving us an ability to meet external objects and events with an attitude that befits the situation and will motivate an adaptive response from us. Desire/Hope, Despair/Sorrow, Disgust/Anger, and Distress/Fear are the four powerful emotional programs that simultaneously simplify and complicate our lives. You’ll notice that central to my diagram and pivotal to the turning arc of time through the lifespan is what I’m calling “faith.” This shouldn’t be confused with a religion’s orthodox collection of truth statements, or doctrines. Here faith refers to something much deeper and much more important than doctrines; it is the individual’s primal mode (or mood) of being, carried in the nervous system as a resting state of basic trust and openness to reality. And since the nervous system is not digital (“on or off”) but analog (“more or less”), each of us embodies an existential mood located somewhere on the continuum between very secure (grounded, calm, trusting, composed) and very insecure (unsettled, restless, wary, anxious). It should be obvious that an individual’s foundational mood or mode of being will be determined to a great extent by the nature of his or her early life experience. A hospitable womb and nurturing home environment will elicit more positive passions (confidence, joy, hope, optimism) and help to set a mood of resting assurance that is open and trustful. Negative events such as neglect, privation, abuse or abandonment will have the opposite effect, closing the nervous system against reality for the sake of survival. This passion-faith axis is where the individual’s general outlook on life is set, as happy, depressed, hostile, or phobic. Farther along the arc of development brings the activation of a more cognitive (thoughtful, intellectual, rational) approach to things. Reason is about causality, relation, intention, and purpose, and with this capacity, significantly assisted by the acquisition and growing mastery of language, our mind goes to work constructing meaning. A key insight of constructivism, as already mentioned, is that meaning is a product of the mind rather than inherent to reality. What is and what happens are the givens of reality; what it means depends on a mind to ask questions and come up with answers. We construct meaning under the supervision and guidance of our tribe, and great care is taken so that our individual worldview is congruent with the collective worldview of our primary group. The intended outcome is a deep and broad agreement between our minds, an agreement that insures a conservative advancement of the larger cultural heritage wherein our identities are mutually defined and managed. We are expected to graduate through a series of life accomplishments, completing each assignment at the right time and in the proper order. Lollipops, gold stars, ribbons, trophies, certificates, diplomas, degrees, bonuses, promotions, licenses, property, real estate, social status, and finally dependents of our own that we will support and shape into “one of us” – all along the way we are making agreements, constructing meaning, and loading our operating system with more data. It is generally true that the first half of life is oriented outward in pursuit of accomplishments that our tribe insists are critical to our success, happiness, and good standing in the community. And then something happens. Our system takes longer and longer to boot up. Our decisions (like key-commands) get bogged down in lag time. Even more concerning, the pursuits and accomplishments that had previously inspired our personal commitment and sacrifice feel increasingly like an exercise in futility. This is a crisis of meaning, and its principal symptoms – as reported in memoirs, case studies, and popular literature – are feelings of emptiness and disorientation: Nothing (or very little) seems to matter, and it feels like everything is reeling off course. Welcome to the Midlife Reset. This rupture in life’s meaning forms a fracture that typically reaches down into the foundations of security. Consequently for many this amounts to a “faith emergency” where reality no longer feels provident or trustworthy. To a once-confident theist it can seem as if god has vanished into nonexistence, leaving him or her utterly bereft and forsaken. A percentage of them will conclude (accurately) that the god they believed in never really did exist as they assumed, that he was a figment of their imagination, a mere figure of myth, a construct of the mind, a convention of orthodoxy. This realization leads some into a disenchanted atheism, others get pulled into a desperate and dogmatic fundamentalism, while a few step through the veil in search of a relevant spirituality “after god” (post-theism). 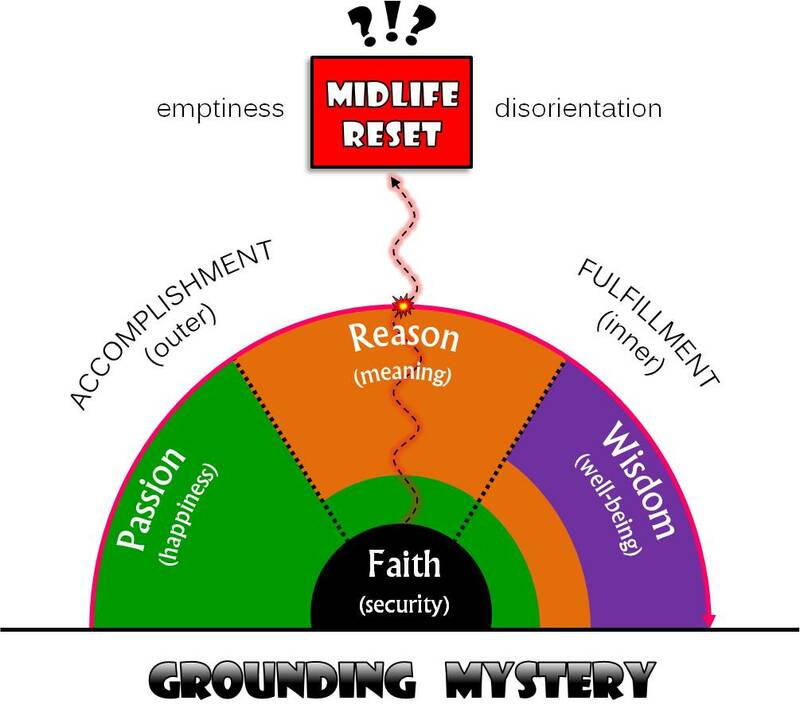 The shift or life transition pressing in at this point of the Midlife Reset was interpreted by C.G. Jung as a radical reorientation, moving through the harrowing yet necessary phase of disorientation, from an outward investment of consciousness to an inward reorientation on something more esoteric (“inner”) and reality-based. We can characterize this as a breakthrough from a life dedicated to worldly accomplishments, to a new life in quest of genuine fulfillment – for the path that will lead to a more grounded experience, a more authentic presence, greater well-being, and a deeper love for life. Ultimately this is preparation for engaging life in a more “soulful” way, less concerned with proving ourselves and getting ahead, than simply being ourselves and sinking deeper into the grounding mystery of existence. Wisdom seeks to reconnect to the faith that may have gotten buried beneath the accumulated “junk data” of convictions, beliefs, and opinions. In taking up a practice of mindful meditation, physical discipline, or creative art we can successfully clarify attention to the degree that our practice becomes a selfless vessel of spiritual life. If reason is involved in meaning-making, then wisdom is what we come to know about life after our assumptions, preferences, judgments, and expectations have been dropped or stripped away. It’s not that we stop thinking about or responding passionately to what’s going on around us. Putting a judgment on something (or someone) and boxing it up in meaning may be a way we can learn something about ourselves, but the neatly labeled package only separates us from what is really real and unique in each situation. Wisdom picks up essential lessons from life without having to haul along the heavy megabyte files containing countless bits of nonessential or even corrupt (exaggerated, embellished, or misremembered) information. My diagram might suggest that a more soulful, spiritually grounded, and liberated life is only available to us in our later years. But in fact the turning-point of what I’ve called the Midlife Reset can come at just about any time. Presumably (in keeping with my theory) it coincides with an accumulated critical mass of irrelevant meaning (junk data), which would make an early incident very unlikely and much less common. It’s also possible that it never comes: the conditions are right for awakening to occur but the individual “successfully” resists, or else reverts to old certainties with a new-found devotion. In the end, perhaps the most desirable outcome is that we are able to rest again in the provident mystery of reality.